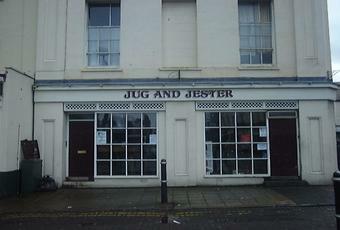 The other Wetherspoons in town. This place is much more small and cramped with a mixture of different rooms. Quite a cosy spoons though, I think I prefer this spoons to the other one, bettter atmosphere aslong as it does not get too busy. Less choice of drinks though. 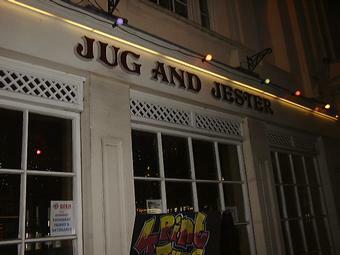 I returned to Leamington on Sunday to visit the Jug & Jester, the town's second Wetherspoons. Similar to the Benjamin Satchwell, at first sight this appears to be a small branch of the chain. But they're both tardis-like. This one has 4 interlinking rooms on different levels with some rather gaudy furniture. But it works and feels different from many of the identikit Wetherspoons. Ales are spread across the top 2 rooms - Backyard Jigger Stout, Banks's Alpha 5, Titanic Iceberg, Roosters Cream, Sharps Doom Bar, Ruddles Best, White Horse Blowing Stone, Greene King Abbot and a couple more 'coming soon'. Cider was Old Rosie. Spent a while here watching Sky Sports News before moving on. The better of the 2 Leamington Wetherspoons. Reasonably OK for a Wetherspoons as it's housed in an old theatre and there is a nice touch in featuring local heroes such as Randolph Turpin on the walls. The beer went down pretty well as did some ribs but the atmosphere is as non-existent as usual even if the train station is but a couple of hundred yards away. A bad JDW is a miserable experience. A good JDW is okay. This is a lot nearer the top of the list than the bottom. 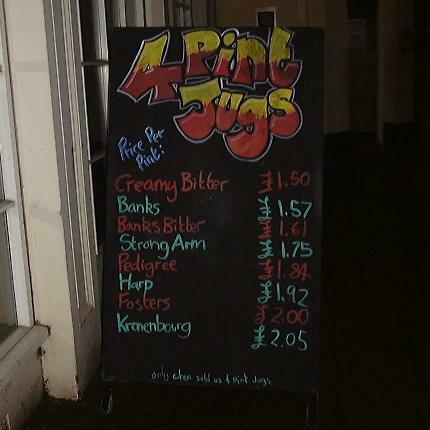 My first pint seemed a bit stale but the manager was amenable to a quiet word and took an interest. The second pint, when I returned a few hours later, was much better. Service was okay, the staff (including doormen) were pleasant and the layout of the pub meant it didn't seem too much like a couple of shop units. Reasonable enough Wetherspoons although only one ale on and that wasn't too great. We upped and left after one pintand headed to the other one.